Freebies that are great for Halloween! Like Attachable Ghosts, a Messgenger's Mantlepece, some Black Hair, and "Elephant" clothes (no ... haven't looked at it yet, but it sounds cool). And the sim is gorgeous! Really. It's worth exploring just to see the great build. Easily one of the most amazing things I've seen in SL. Free fishies (3 kinds, it looks like, despite 4 in the box, but Copy/Mod) at the Tuff Old Boats Store. They are textured, rotating cylinders much like the Linden fish in your Basic Inventory, but very crisply rendered. 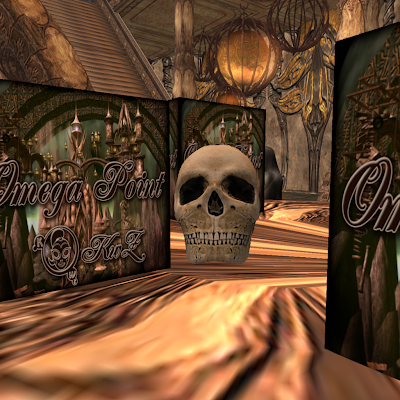 While here, enjoy free rides on a variety of boats in one of the most beautiful regions in Second Life. Definitely set your graphics to Ultra when you explore. Just an FYI, the boats are so nice I borrowed some $Lindens to buy a white-green rowboat rezzer for the Isle of Lesbos. 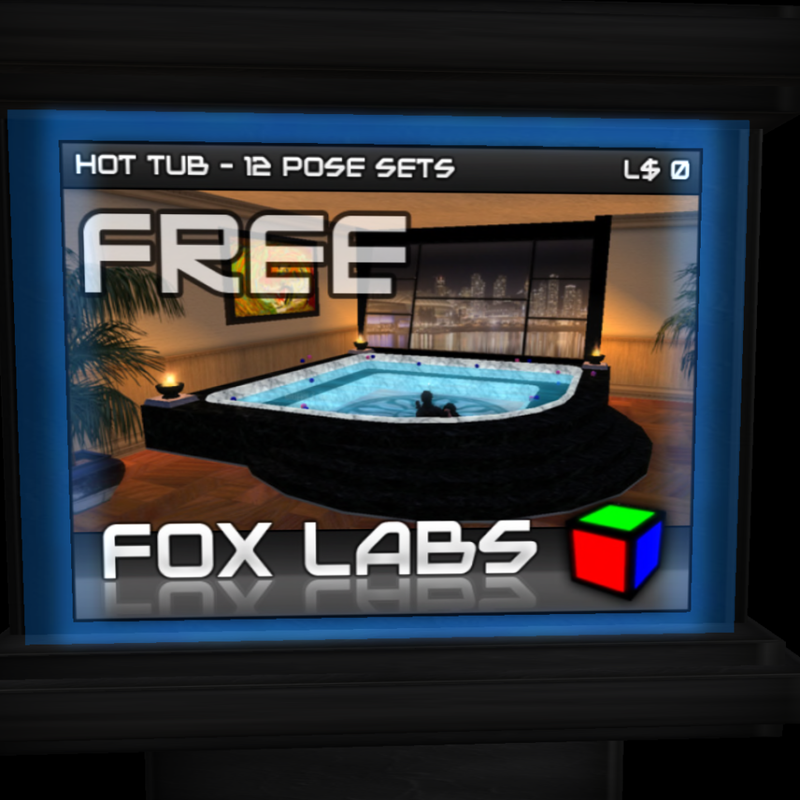 Found some nice Freebies from Fox Labs recently when I was wandering about. See? It pays to explore. 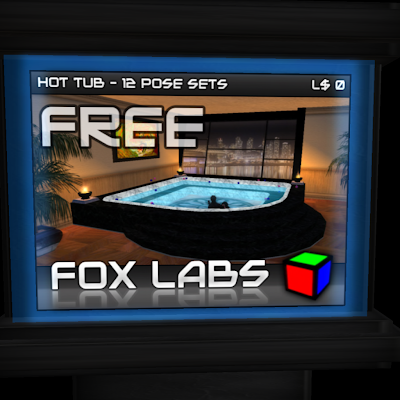 Head to the second floor of the shop for this hot tub, an Object Thrower (toss something you put in the HUD at someone), a full-perms sculpty tree-bush prim, a really nice 1-prim multi-pose stand, a 1-prim footbridge, packs of sculpty furniture parts, packs of sculpty fences, and a Sky Writer HUD. Many near by shops have Lucky Chairs and Midnight Mania boards. Explore!! New limited time mermaid halloween lucky board at ClubMermaid. Board changes every 10 mins with wildcards. Also they have a one day only sale on thier mermaid storm outfits. Goodluck. New lucky board from Silly Girl Market for some cute halloween goodies. It's at 2 locations and boards change every 7 mins with wildcards. Goodluck. 2 new group lucky boards at Honey Kitty for halloween shoes. Group inviter is nearby, and the boards change every 10 mins with wildcards. Past goodies available too. Goodluck. 2 new lucky boards for halloween at Spica. Both boards change every 10 mins with wildcards. Goodluck. New limited time lucky boards from Sx3. They change every 15 mins with Game (you have to answer a math question to win) and wildcards. New halloween outfit added to the lucky board at Heureux. Board changes every 5 mins with wildcards. Goodluck. 2 new prizes added to the Super Possessed Lucky Chair (since I last blogged it). Chair still changes every 60 mins. Goodluck. New lucky board at JW for a very nice jellyfish tank. Board changes every 10 mins with wildcards. Goodluck. New lucky board at Heureux for a halloween pipe. Board changes every 5 mins with wildcards. Also past goodies available too. Goodluck. Other lucky boards from Leia Galaxy. 2 different boards one for a scooter and one for a dress. Boards change every 5 mins with wildcards. Goodluck. A couple limited time lucky boards at Leia Galaxy. One contains 2 dresses and one contains a halloween scooter. They both change every 5 mins with wildcards. Goodluck. New lucky boards at Milky Way. 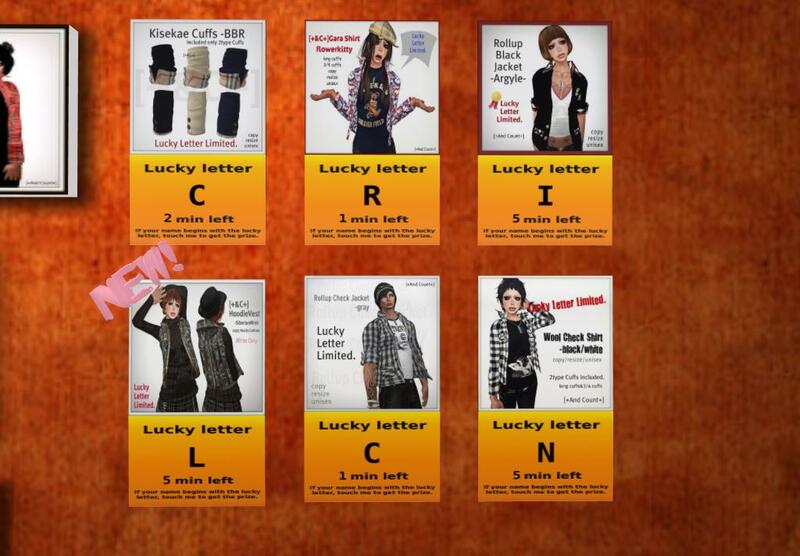 They all change every 10 mins with wildcards, these are pics of a few prizes. Goodluck. New lucky board at Farouche for eyes. Board changes every 5 mins with wildcards. Past goodies available too. Goodluck. 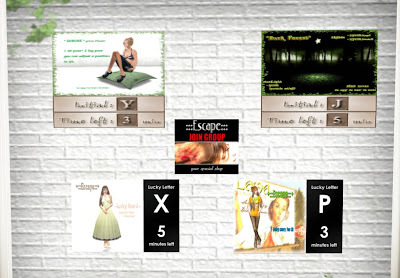 New jackety themed lucky boards at +And Count+, they all change every 5 mins with wildcards. Goodluck. A little bazaar is set up at Deep Blue Sea. A couple of my fave goodies are the free Hal*Hina top. And the cute lucky board for a couple rideable dolphin. Board changes every 5 mins with wildcards. Goodluck.